Kim is the Associate Director for Undergraduate Admissions. She started her career in Christian Higher Ed in the 90s at Wheaton College, working in Admissions and Student Development. After serving 13 years overseas in theological education in Kenya and Tanzania, her family moved to Wilmore, KY for her husband to be a professor at Asbury Theological Seminary. 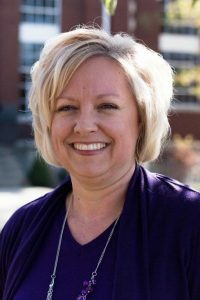 In 2013, Kim started working at Asbury in the Admissions Department directing Asbury Academy. Kim has also served Asbury as the Assistant Director for the Center of Career and Calling. She also adjuncts in our School of Communication Arts, teaching Intercultural Communication. BA in Interpersonal and Group Communication, MA in Intercultural Studies (Wheaton Grad School), currently a PhD student studying Communication.